How familiar is the image of the sportswear clad, smiling mother, coffee in hand, happily pushing the SUV of strollers down the perfectly manicured street? This depiction of motherhood is all too prominent in our society. Mothers are often fed the idea that the transition to motherhood is seamless and the bond with baby is immediate. Peel back the curtain a bit and we will see for many women the journey into parenting can be a bit bumpy. Here are some tips a new mother can put into practice to help make this path a little easier. When sleep quality is poor, it affects the individual’s ability to function well and leaves the person feeling scattered, irritable and foggy. 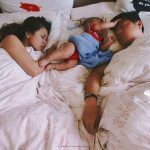 Unfortunately, new mothers come into motherhood already a bit sleep deprived due to the discomfort and disruption of sleep towards the end of pregnancy. As cliche as it sounds, try napping when baby naps. Yes, your to-do list will remain undone, but sleep is more important than the dishes. Also consider sharing the night time feeding with a partner. This middle of the night, quiet feeding time could be a sweet time for partner and baby to bond. One of the most invalidating and belittling sentences a new mother can hear is “all that matters is you and baby are ok.” In the U.S., 45.5% of women reported a traumatic birth (1) For those who experienced trauma after birth, please seek help. You are not to blame for what happened to you. Many women who undergo a traumatic birth experience have a hard time connecting to their baby and establishing healthy breastfeeding. Partners and friends should allow the mother a safe space and time process her experience and not rush her to get past the experience. Suppressing these feelings can lead to postpartum depression. 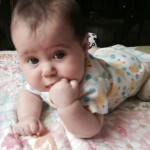 Being home on maternity leave while trying to figure how to care for your new baby can be incredibly overwhelming and isolating. Get out of the house and find some other moms to connect with. Most areas have new mom groups, meetups or baby classes. Throw in a baby yoga class and reap the benefits of a little exercise to boost some well needed endorphins! A loss of identity and connection to life before baby is a major struggling point for many women. Yes, you have birthed a baby, you have a new role and responsibilities in your life, but you are still you! When the dust settles and you have found some sort of routine, work some of your pre-baby interests and activities back into your life. Feeling satisfied and fulfilled in your life as a person not just a mother, will positively model that choice and behavior to your child. 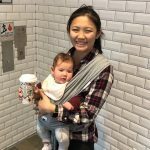 February Mom of the Month: Meet Michelle Tsang!